While I may not have all the facts, what my conversations with lots of founders have revealed is that there is a need for more awareness and a deeper understanding about the target customers and the job that a startup is helping them accomplish. As a startup, it is absolutely critical to go after a very narrowly defined customer segment that is deeply feeling the pain that you are trying to alleviate. You need customers for whom this issue is giving them sleepless nights. They are gladly willing to accept your solution as it is, without all the bells and whistles. They want to thank you for thinking of them and building this solution. On the other hand, if they come up with reasons (excuses) for not using it, (eg. we would use it if it had feature X) then they are not your target customer for now. It means they are not feeling the pain acutely enough, or that pain is not their top priority. They are willing to suffer even though you are showing them a remedy. There is no point in focusing on them at this stage. There are two simultaneous processes that should happen – as you begin defining your target segment, you discover their motivations, wants, and needs in more and more detail. The two processes feed on each other. Soon you’ll know the customer inside-out, what are their anxieties and fears, what are their habits and desires. There is a misunderstanding that these things don’t matter in B2B products, when in fact they are even more critical given the multiple actors involved in a sale. One must understand not just the primary user, but also the other stakeholders. The reason is that we don’t want customers to choose a product, we want them to buy our product. And the way to get them to buy our product is to make sure that we hit all the right spots functionally and emotionally. We give them not just a reason to buy, but also no reason not to. The offering fits them so well, it is a no-brainer to acquire it. The entire buying and consuming experience is as if tailor-made for them. Another important misunderstanding is about what makes customers buy. It is not who they are, but the situation that they are facing, and the desire to change that situation that makes people buy. For example, it is normal practice to create an ideal target customer profile with demographic variables like industry, business type, revenue, company size, number of employees, etc. None of those variables will by itself be sufficient to cause them to buy our product. However if they find themselves in a situation where operations are now getting unmanageable manually, or if they faced a breach and they need to ensure that it doesn’t happen again, will they be willing to buy a new solution. It is the push of the situation that will make them amenable to consider a change to “business as usual”. And when they are in this open frame of mind, if there we are, knowing exactly what they are going through and offering our solution at their disposal, they will for sure be willing to buy. Hence it is critical to discover what are the situations under which a customer considers our product as a viable solution, and what are the driving factors in his decision. All this should be distilled into an easy to communicate idea. 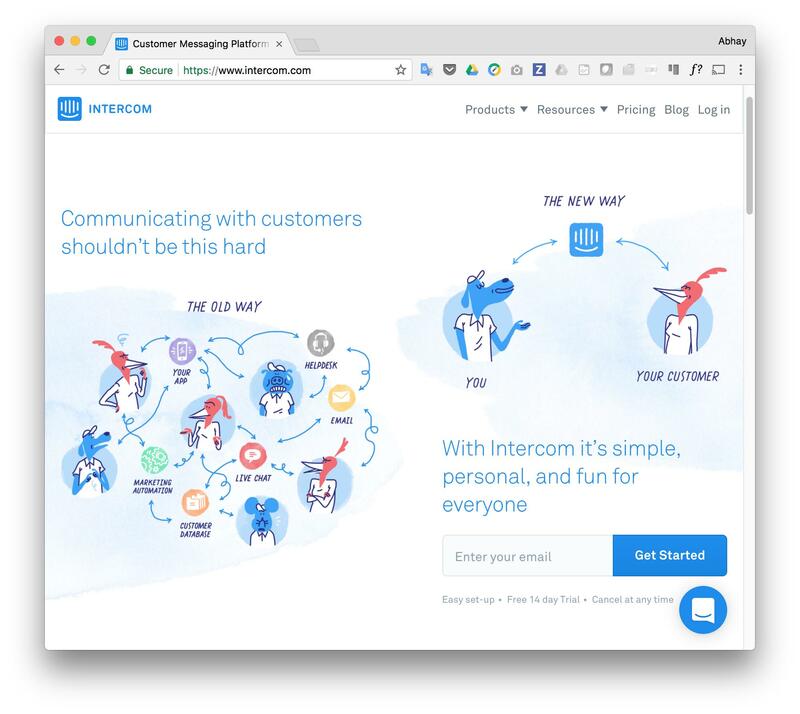 Consider Intercom’s website: The image makes it very clear what the problem they are trying to solve for the customer, and how the customer’s life will be better after the solution is implemented. Normally, the way to discover this “brand promise” is through customer interviews, there is no replacement to direct discussion. However, we can start with our understanding of the customer situation, and then refine with subsequent interactions. These customer insights are the most important source of competitive advantage for a company. Your superior understanding of your customer is difficult to emulate. Insights help align your functional organizations to deliver the experience that gets the whole job done (pre-sales, sale, support, service, website, messaging, and more). It is this endeavor to completely understand one’s customer, that allows a startup to build a great product, outstanding user experience, and ultimately a successful company.